Like most consumer electronics, computers tend to break down due to low quality capacitors that fail before their time. In this example, my brother’s computer switched itself off after a period of instability, and would not turn on again. Manufactured by TK, max voltage 6.3V, capacitance 820uF, max operating temperature is 105 degrees Celsius, and it’s from the ATWY series. 646A is a date code. In most electronics repair situations you’d simply replace the broken capacitor with a new one of equal capacitance and the same or higher voltage rating. This part measured an ESR of less than 1.1 ohms, which for most circuits would indicate a healthy component. In modern computers however, specs are much tighter, and parts that would work perfectly in most circuits can make a computer fail. 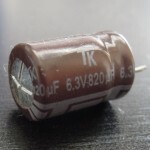 A google search for “TK ATWY” led me to the data sheet, which revealed that this 6.3V, 820uF capacitor has an Impedance (other word for ESR) of 0.036ohms, and a max ripple current of 1140mA. Then simply make sure you get the polarity right, and the board should work again. If not, this means the failing capacitor probably blew other components as it went out of spec. 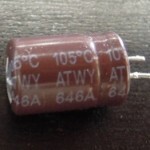 In most cases, replacing the faulty capacitor(s) solves the problem. After a repair like this it’s probably a good idea to clear CMOS+RTC, just in case something got corrupted when the computer became unstable. This entry was posted in Electronics. Very Useful tips. Thank u.